Several hours before you wish to serve dinner, purée the garlic and oregano with a few splashes of the olive oil. Slather this marinade all over the steak. When you are ready to cook, preheat your grill to its highest setting. Season the steak with salt and pepper and begin slowly grilling it. Take your time and keep an eye on the grill heat, adjusting it to prevent burning. Flip steak as it sears. Once it has browned, flip it frequently to further prevent burning. To cook a piece of beef this large well done would be criminal! 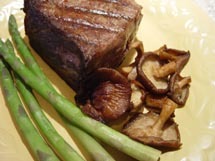 It should be cooked to medium rare or rare to maximize its juiciness, about 20 minutes or more. Once it’s done, turn off the heat and rest the steak for 10 minutes or so, giving the meat a chance to relax and re-absorb all of its moisture. Premature slicing will release agitated hot moisture that is lost as juice. As the beef grills, mound the arugula and basil leaves in the middle of a large festive platter. 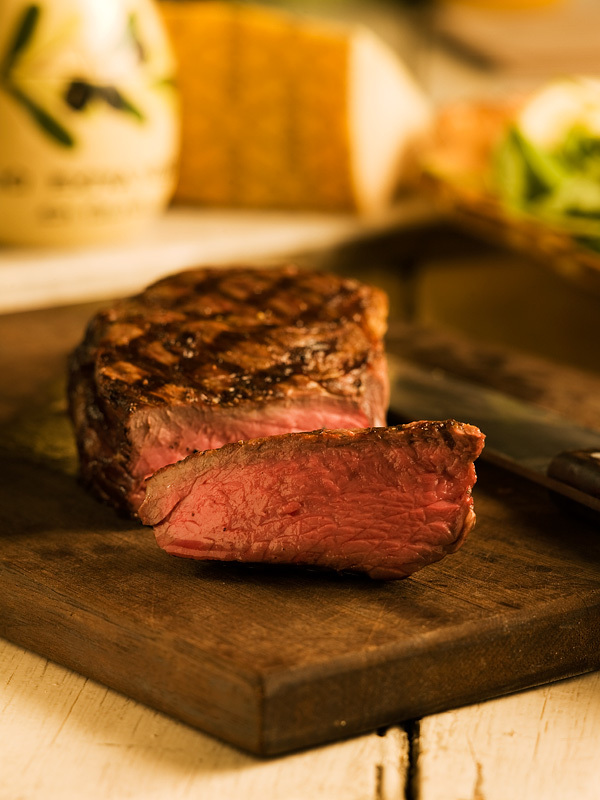 Present the steak to your table on a wooden cutting board with a sharp knife. Slice it very thinly and arrange the slices around the arugula. Sprinkle everything with lots of olive oil, coarse sea salt and lots and lots of coarsely ground fresh peppercorns. You may theatrically zest the lemon over the salad, then squeeze on the juice. Last, but not least, use a vegetable peeler to garnish the works with shavings of Parmigiano Reggiano. Order your striploin ahead of time from your specialty butcher, and ask for large one that has the bone in. A large steak takes longer to cook because it takes time for the heat to penetrate to its centre, which is, unfortunately, also enough time for the exterior to brown and potentially scorch. Use your best judgment to gauge doneness. Poking, prodding, pinching, probing, even peeking. A meat thermometer works well, but even a sneak peek at the interior is better than guessing. Long ago, the cooks of the world discovered the efficiency of simmering tough meat in tenderizing water. They also discovered that they could add lots of local flavour to make the results more interesting. 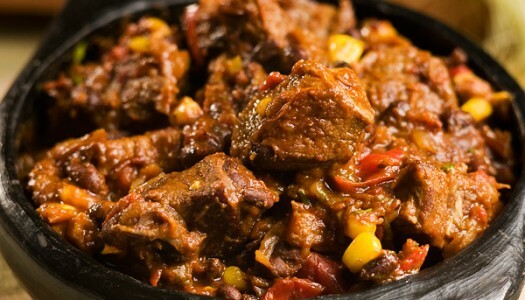 Today, beef stews are a part of cuisines and cultures around the globe. This one features the bright familiar flavours of the Southwest. You don’t need a fire blazing in the backyard or a fancy barbecue to cook a great steak. Pan-roasting works well too, especially if you start with a great steak, use lots of butter and finish with browned onions.